Given my love for all things super hero, it may surprise some people to learn that I never really got into the whole comic book thing. There only three or four comic books that stand out from my childhood, and I assume that I was given them by someone. I can vaguely remember a Thor comic, a Ghost Rider comic and an Obsidian comic, but that is about it. My passion has always been for all the peripherals, the tie novels (I really should do a post on some of the good ones I have come across), the movies and especially the animated series. I devoured Smallville and if I ever met Bruce Timm I would probably fall down at his feet, and I have to confess to spending a lot of time reading Wikipedia entries on story arcs and characters (which is pretty sad, I know). I think Avengers is one the greatest movies ever made and I dream of a great Superman movie. But, the actual comics themselves? They left me cold, to be honest. I think there were a few factors that contributed to this. One was the often convoluted storylines that made it hard to just dip and pick up what was going on fairly easily. There was also the thinly concealed contempt that the big comic houses seemed (and still seem to) have for their readers, as if they felt that whatever they did, the fans would keep coming back. So, they just kept on with the retcons and reboots and plain butchering of characters. But, the biggest obstacle for me has been the sheer immensity of the investment of time and money involved in being a serious collector of comic books. It’s usually not enough to read the core comics of a story arc, there are all the crossover titles as well, and it can be pretty daunting for the casual reader. It may seem lazy, but it has always just been easier to get into the condensed versions, the movies or the novelisations or the TV shows, which hopefully take all the good bits and discard the fat. The comics that I had managed to get into in the past were the self contained ones, that didn’t rely on too many external titles. Perhaps my favourite was the Kingdom Come series, which in my opinion is a work of Art witha capital “A”. I actually purchased the trade paperback of that by mistake in an attempt to buy the very hard to get Eliot S! Maggin novelisation, but it was serendipity. 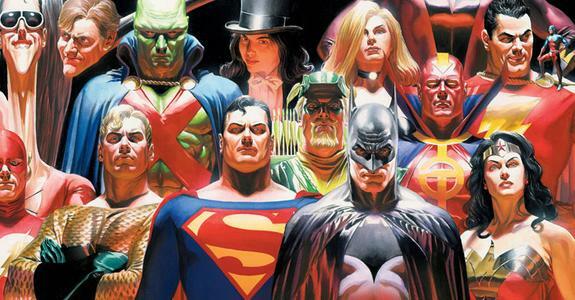 I’d buy anything involving Alex Ross. But, recently I discovered a real game changer and it has changed the way I have looked at comics, and I fear for my financial future. It’s the Comics app by comiXology on my iPad, and it is brilliant. A very quick rundown, the Comics app is very much like a Kindle store for comics. It allows you to browse titles by the major publishers and a lot of the smaller imprints. You can then purchase the titles within the app, download them and read them on your iPad. And this is where the app truly shines. It shows off the potential of the iPad as well as any app I have seen, taking advantage of the screen real estate and the graphical interface. As you read it zooms in on the current panel, then out to give you the whole page view. And, just like with ebooks, you can stores thousands of comic titles without the hassle of finding shelf space! In terms of ease of use it really makes the comic book experience hassle free. But, it’s this ease of use that is the major problem, and has shown me that comic books are evil. It’s so easy to go on a shopping spree, especially when you get to the end of a comic it gives you a button to buy the next one. So, in the past three days I have purchased more comics than I had in my entire life beforehand. As much as reading on the IPad has ignited a fresh desire to read comics, I did notice that there is still the same issue where you need to read all the crossovers, Final Crisis especially gave me the impression I had missed a lot of backstory, But, perhaps because of the convenience of tracking things down, I find I am more tolerant of this. So, what comics would people recommend for a relative newbie to the comics world? This entry was posted in Geek, Pop Culture and tagged Alex Ross, comics, DC Comics, iPad on May 29, 2012 by David. 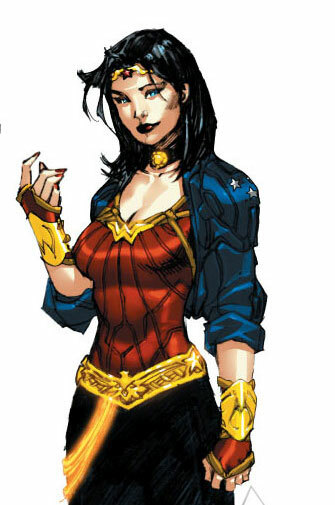 The geekosphere is all a-twitter with discussion of the recent announcement that Wonder Woman will be taken in a new direction, with a radical reboot of her continuity and a costume redesign (which personally I don’t really like). There is an in depth interview with the new writer here. Every mythos needs a reboot at some point, if only to trim away the dead wood of lame storylines. But, I think sometimes publishers tinker for the sake of tinkering, and in their desire to be “edgy” or “relevant” they lose sight of the heart of the character. DC need to be careful here, as Wonder Woman is one of the “Big Three” and they don’t want to stuff it up. Of course, I can take a degree of cynical amusement in the fact that they have given themselves a “Get out of jail free” card. As far as I can understand, the premise of the reboot is that Wonder Woman’s timeline has been altered and she is trying to restore it, so if this proves a dud they can just say she has fixed it and go back to where they started from! I don’t have a lot invested in this change, I don’t actually read that many comics. For a more passionate viewpoint and some very good reasons why this is a bad thing, it is worth checking out Ragnell’s article at Written World. Be warned, though, don’t click on that link if you can’t handle swearing! I have the bad feeling she is right about how this will turn out, but Wonder Woman has survived Nazis and gods and even The Paper Man (cue ominous music). I am sure she can survive this. 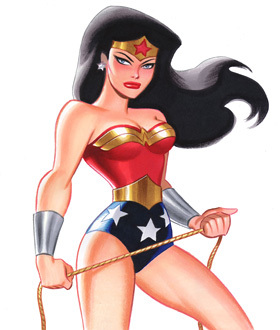 This entry was posted in Geek and tagged comics, DC, reboots, Wonder Woman on July 2, 2010 by David. After obviously waiting to see how Marvel’s foray went, DC Comics have finally released their iPhone/iPad app. Looks pretty! This entry was posted in Geek and tagged comics, DC, iPad, iPhone on June 24, 2010 by David.